It can’t be that costly to just use quality power supplies across all platforms, and it would definitely speed up my work. 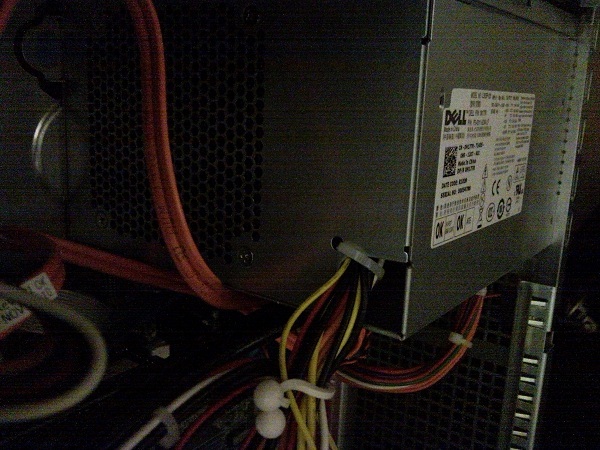 Over Christmas I deployed a two node Hyper-V Failover Cluster with a Dell MD3220i SAN back end. Its been running for almost a month with no issues, and I’m finally finishing the documentation. My apologies if the documentation appears “jumpy” or incomplete, as half was done during the setup, and the other half after the fact. If you’d like clarification or have any questions, just leave a comment. Hyper-V Manager and Failover Cluster Manager (free tools from RSAT). We may eventually use System Center Virtual Machine Manager, but for an environment this small, its not necessary. The only hardware related information I’m going to post is in regards to the network design. Everyone’s power and physical install is going to be different, so I’ve left that out. Only connect one LAN port from each server until you have NIC teaming set up. 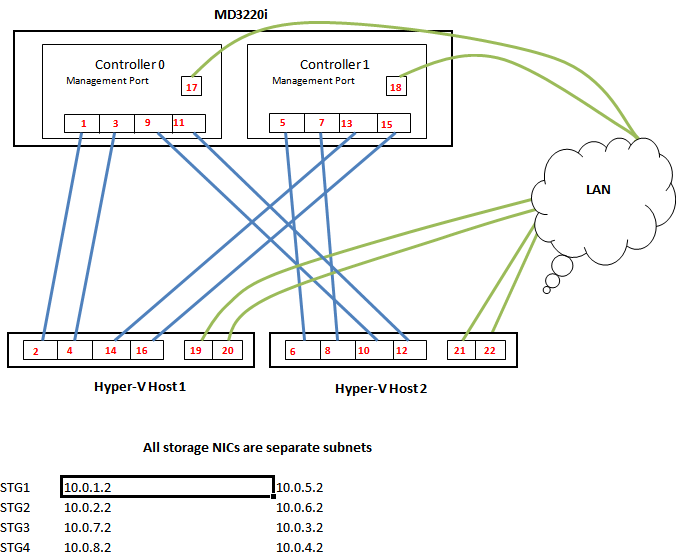 With this setup, the two onboard NICs for each host will be NIC Teamed and used as LAN connections. 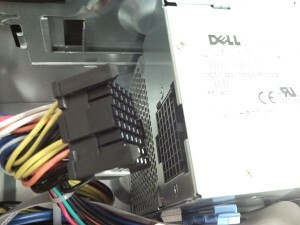 The 4 other NICs will be iscsi NICs, with two ports going to each controller on the MD3220i. As you can see, each NIC has its own subnet; there is a total of 8 subnets for the iscsi storage, with 2 devices (Host NIC and Controller NIC) in each. I tried this at one point with 3 NICs per host for iSCSI, so that the 4th would be dedicated for Hyper-V management, but I ran into nothing but problems. Ensure that within the BIOS, all virtualization options are enabled. Restart the server and ensure the two 146GB hard drives are configured in a RAID1 array. If not, correct that. Proceed through the setup accepting defaults. You will need to provide a USB stick with the S300 RAID controller drivers before you can continue with setup. On the next screen, choose “Drive Options (advanced)”, and delete all existing partitions, unless there is a recovery partition. Click Next and the install will proceed. When the install is finished, you will need to specify an admin password. Press 2 to change the computer name to the documented server name. Choose option 4 to configure Remote Management. Choose option 2 – Enable Windows PowerShell, then return to main menu. 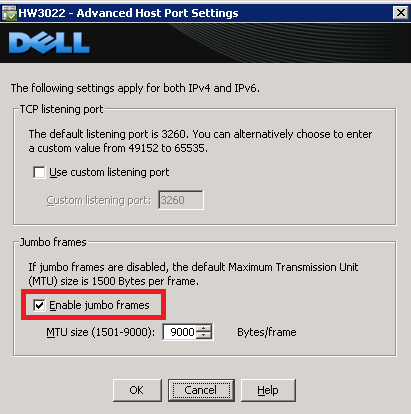 Choose option 8 – Network Settings; configure a single LAN port according to your design, so that you can remote in. 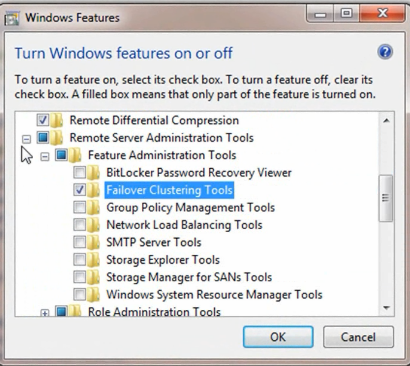 Choose option 11 – Failover Clustering Feature – choose to add this. When complete, restart. Then we need to add the server to the domain. Press 1 and push enter. Allow installer to restart the computer. Choose All items to update. When complete, restart the server. From settings done previously, you should be able to use Remote Desktop to remote into the servers now. However, additional changes need to be made to allow device and disk management remotely. 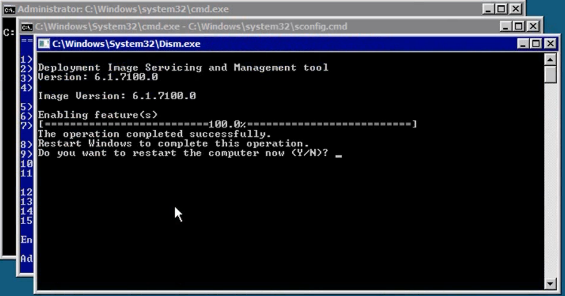 Start an MMC and add two Group Policy snap-in. Choose the two Hyper-V Hosts instead of local computer. 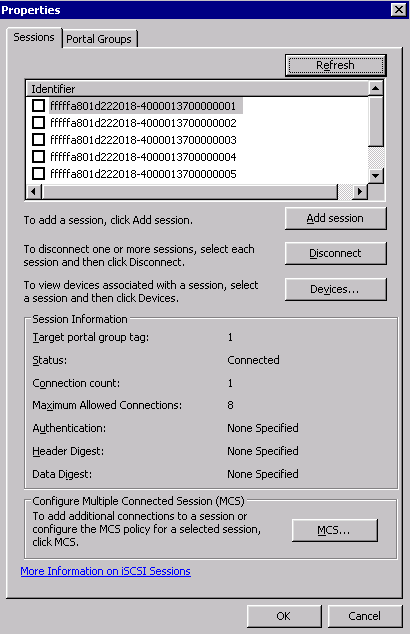 Computer Configuration > Administrative Templates > System > Device Installation > Allow Remote access to plug and play interface (set as enabled). The best way to manage a Hyper-V environment without SCVMM is to use the MMC snap-ins provided by the Windows 7 Remote Server Administration Tools. (Vista instructions below). Once installed, you need to enable certain features from the package. In the Start Menu, type “Programs”, and open “Programs & Features” > “Turn Windows Features on or off”. 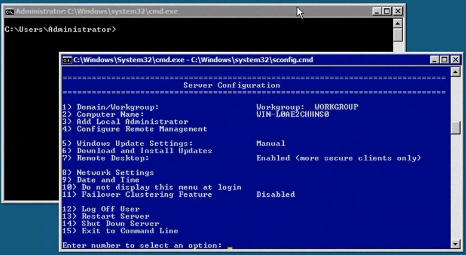 However, the Failover Cluster Manager is only available within Windows Server 2008 R2 or Windows 7 RSAT tools. This command needs to be run on the CLIENT you’re accessing from as well. The IP Addresses of the storage network cards on the Hyper-V hosts needs to be configured, which is easier once you can remote into the Hyper-V Host. 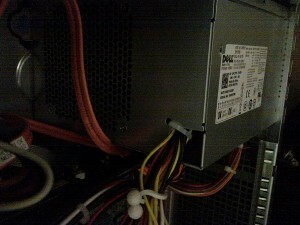 With the Dell R410’s, the two onboard NICs are Broadcom. To install the teaming software, we first need to enable the dot net framework within each Hyper-V host. Copy the install package to the Hyper-V host, and run setup.exe from the driver install, and install BACS. When setting up the NIC Team, we chose 802.3ad protocol for LACP, which works with our 3COM 3848 switch. This will display the interfaces that are connected. You can work one by one to rename them as you plug them in and see the connected state change. netsh int set int "Local Area Connection" newname="Servername-STG-1"
If you can’t access the .inf files, you can also run the setup.exe from the command line. This was successful for the Broadcom driver update and Intel NICs. We use a combination of SNMP through Cacti, and Dell OpenManage Server Administrator for monitoring. These Hyper-V Hosts are no exception and should be set up accordingly. Then add the server as a device in Cacti and begin monitoring. 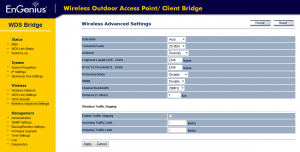 The MD3220i needs to be configured with appropriate access and network information. Before powering on the MD3220i, see if you can find the MAC Addresses for the managment ports. If so, create a static DHCP assignment for those MAC’s aligning with the IP configuration you have designed. The MD Storage Manager software needs to be installed to manage the array. You can download the latest version from Dell. Once installed, do an automatic search for the array so configuration can begin. Ensure that email notifications are set up to the appropriate personnel. Navigate to where the key file is saved, and choose it. Below is an image of our disk group, virtual disk, and CSV design. What works for us may not be most suitable for everyone else. Each virtual disk maps to a virtual machine’s drive letter. My only concern with this setup is the 2 TB limit for a VHD. By putting our DFS shares into a VHD, we will eventually approach that limit and need to find some resolution. At the moment I decided this was still a better solution than direct iscsi disks. 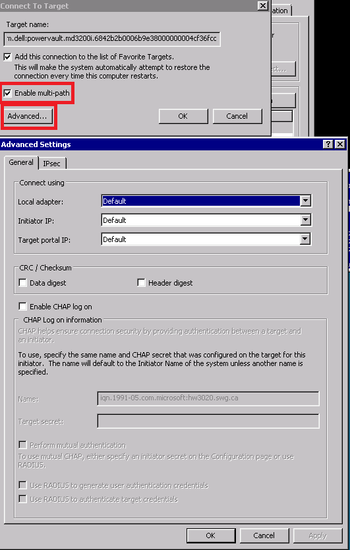 On the Configuration tab, copy and paste “initiator name” within the MD Storage software. Remote into the Hyper-V hosts. On the second tab, check to enable iscsi support. Reboot the server after that. Again on each Hyper-V host, from the command line, type iscsicpl. If prompted to start service, choose yes. 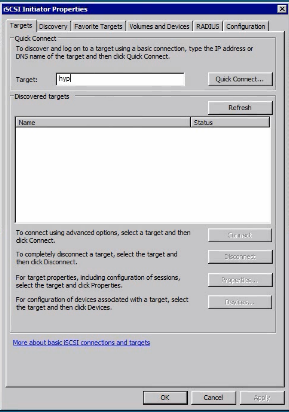 When the iSCSI window appears, enter any IP address of the MD3220i controller, and click QuickConnect. A discovered target should appear there, with a status of “Connected”. Highlight that target, and select “properties”. The “Sessions” window will appear, with one session listed (I know the screenshot is wrong). Check that session, and click “Disconnect”, then click OK.
Do this for each storage NIC on each server. There should be 4 connections per server. Then click the “Volumes and devices” tab, and select Auto-Configure”. You should see one entry for each disk group you made. Now we should be able to go to disk management of a single server, create quorum witness disk and your simple volumes. If you haven’t performed the steps in the Remote Management & Tools section, do so now. You will see your 3 disks within this control, as offline and unallocated. You want to initialize them as GPT devices, and create a simple volume with all the space used. Name the 2GB one (which was created during disk group setup on the MD3220i) as Quorum. Those steps only need to be applied to a single server, since its shared storage. Further disk setup happens after the Failover Cluster has been created. Use the powershell script from there, for each network card. This MUST be done after IP addresses have been assigned. Where the IP address is correct for the interface you want. 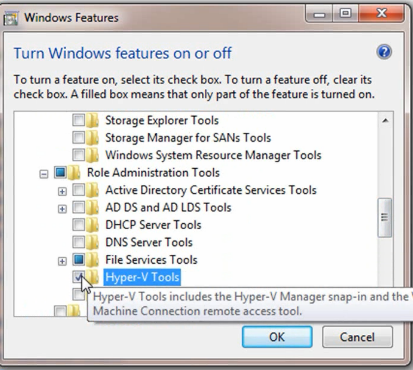 On each host, configure using Hyper-V Manager. Create new virtual network of external type, bond it to NIC’s dedicated to external LAN access. Ensure that you enable management on this interface. 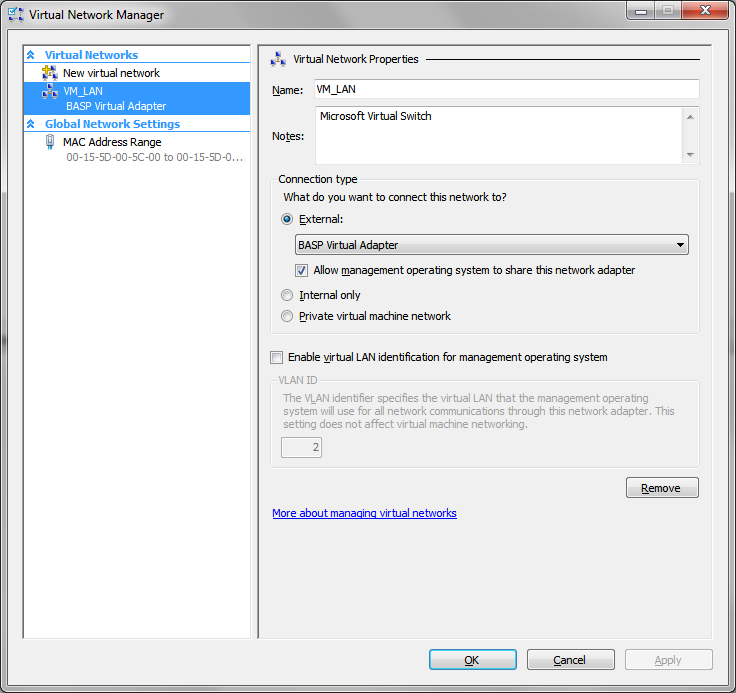 Virtual Network names must match between Hyper-V hosts. You may need to rename your virtual network adapters on each Hyper-V host afterwards, but IP addresses should be applied correctly. Name the Cluster, click next. Go to Networks, and you’ll see the storage and Virtual NICs that you have configured. Modify the properties of the storage NICs to be named logically, and select “Do not allow cluster network communication on this network”. 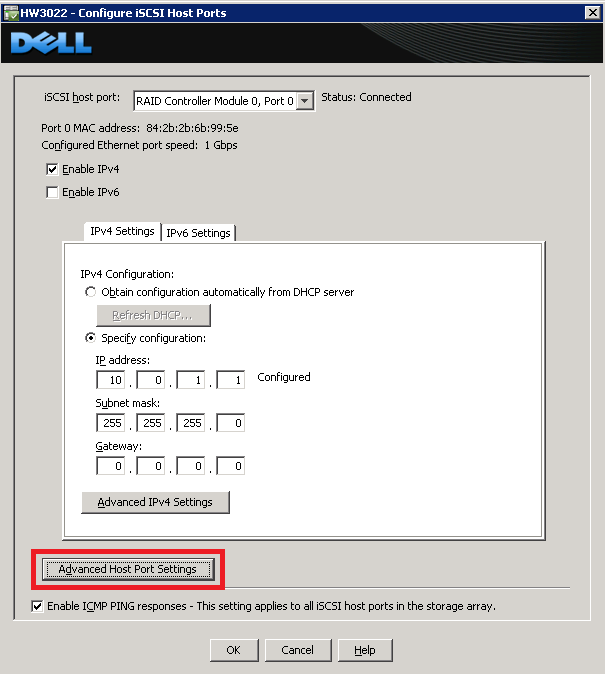 Modify the properties of the virtual LAN NIC to be named logically, and select “Allow clients to connect through this network”. 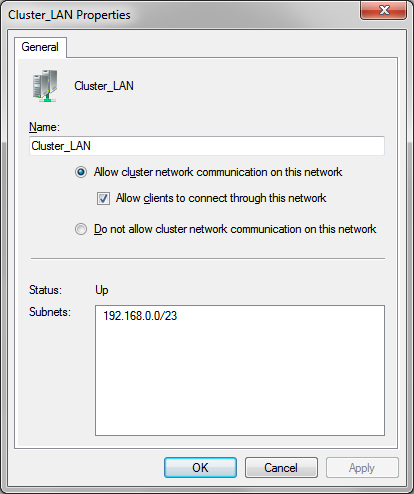 Right click Cluster, “Enable cluster shared volumes”. 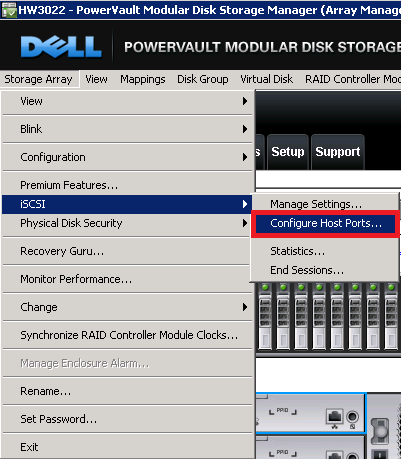 Choose “Cluster Shared Volumes”, click “add storage” and check off existing disks. Within Hyper-V Manager, change default store for virtual machine to the cluster storage volumes (CSV) for each host. Ensure it’s stored in the CSV. Finish the install, it will finish the High Availability Wizard. 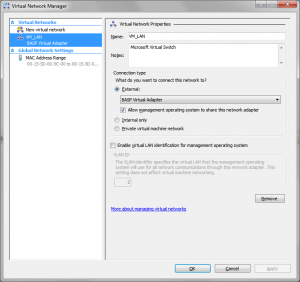 Can set a specific network to use for Live Migration within each VM properties. Enable heartbeat monitor within the VM properties after the OS Integration tools are installed. Other than what I discovered through the setup process and have included in the documentation, there were no real issues found. Oddly enough, as I was gathering screenshots for this post, remoting into the servers and using the MMC control, one of the Hyper-V hosts restarted itself. I haven’t looked into why yet, but the live migration of the VM’s to the other host was successful, without interrupting the OS or client access at all! Nothing like trial by fire to get the blood pumping. A quick review of the Engenious 5611P that we have been using for a few months to connect two offices. My company recently leased space in a building adjacent to our head office. These two buildings are separated by 250 feet of parking lot, with clear line of sight. We wanted network connectivity for data, as well as Voice Over IP, so that an additional phone system and receptionist aren’t required. 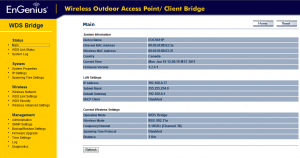 A wireless link is the obvious solution in this case, and we started with a Cisco WAP4410N. The interface for these devices was good, and setup was quick. 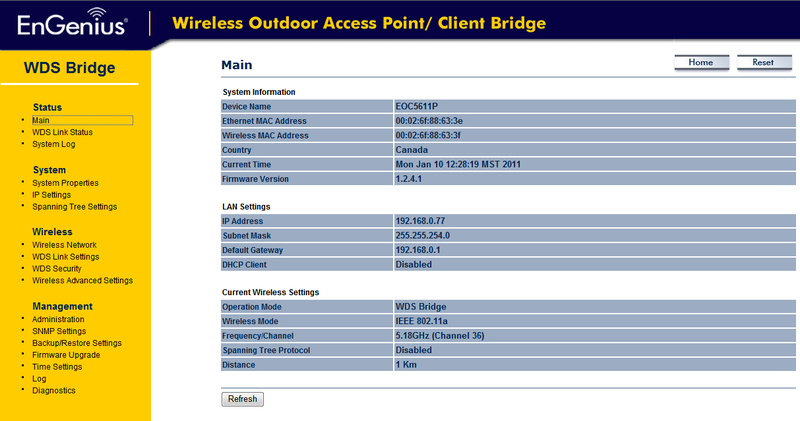 We used the draft-N protocol and setup a WPA2 secured WDS bridge. For ease of install we placed the two devices within the building behind the window. Performance was acceptable, and after a few tests we deemed the link good. However, after about a week of activity in the office, there were severe performance issues, with packets dropping frequently and the Cisco devices locking up. Based on that, we purchased two Engenious EOC-5611P devices, to set up an 802.11a network. Since setting this up, the link has been rock solid, through hot weather (35 Celsius), cold weather (-40 Celsius), rain and heavy snow. (again, these are indoor behind a window). Our VOIP equipment has zero problems and we haven’t had any issues with the software on the devices. The only downside that we have found of the Engenious devices is the lack of WPA2 encryption while using the bridge mode. Currently only WEP is supported for that mode.